Let's have some fun on this Monday. It's mid-May, it's warm, it's time for sunglasses. 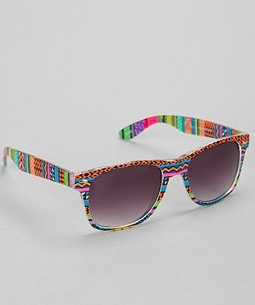 Sunglasses in my opinion should be a whole lot of fun. It's an accessory that doesn't have to be classic, you take them on and off a handful of times during the day, so why not make them stand out? 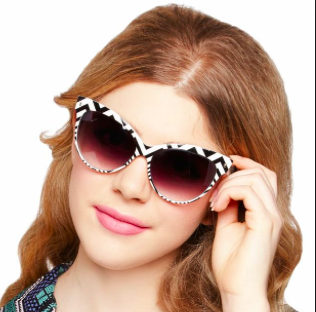 Let's take a look at these fabulous patterned shades. Navy polka dot. Does it get any better? I love these summer ready shoes. Perfect for jeans, sundress or even a suit. The vintage surfer trend is one that I'm still working on getting behind, this however, I'm all over it. Summer meets Saved by the Bell. I'm struggling with these shades. I cannot decide what I love more, the lavender, the retro shape, or the blurred graphic sides. The ombre on the glasses is so feminine. The shape means business. How do you style your shades? 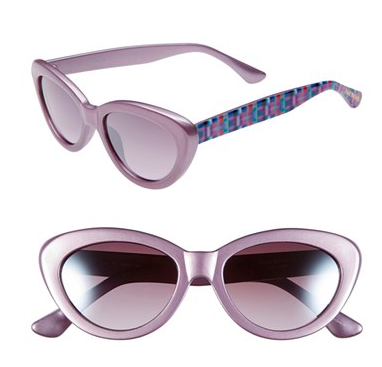 Are you a tortoise classic kind of girl or something a bit more eye catching, something patterned?